Advertiser.ie - WHAT’S CAUSING MY ACHES AND PAINS? Body aches and pains are an everyday part of life for all human beings. There are many causes and reasons and usually there is an innocent explanation for it. But if the pain continues for a long time and starts affecting your life then it’s time to try and find out the underlying reason. You should consult your Doctor sooner rather than later so that he/she can investigate and if necessary send you to a specialist for further investigation and advice. • Travel, especially air travel or long commute, traffic jams. If your doctor has ruled out any serious illnesses, then complementary therapies might be able to help depending on the cause. In our clinic we use a multi pronged approach in treating many conditions with evidence based therapies such as Physiological Regulating Medicine (P.R.M ), Gut Health and Microbiome restoration, Nutritional and Nutraceutical therapies, Lifestyle Medicine, Natural Hormonal Balancing, Glandular support, Soft tissue and joint support, Complex Homeopathy, Herbals, and Needle free Medical Acupuncture, Therapeautic Mindfulness and CBT techniques to achieve excellent results. Holistic Health & Stress Clinic is now at URBAN wellbeing, Tuam Road, Galway, Ireland . Dr Bhatti is a qualified Medical Doctor with a Postgraduate Diploma from the Royal College of Physicians and Surgeons in Ireland. He has worked in all the main hospitals in Galway, Port Washington Hospital, Milwaukee General Hospital, Wisconsin USA. 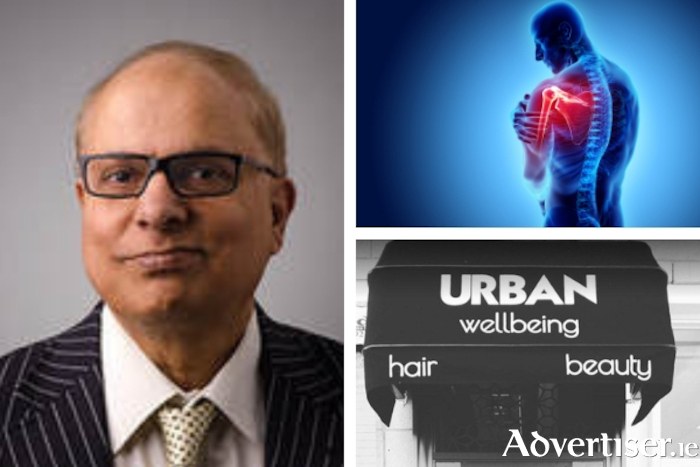 He has worked in the fields of medicine, chest medicine, surgery, cardiology, orthopaedics, skin, paediatrics, geriatrics, psychiatry and has over 30 years practise and teaching experience in the field of complementary medical care. Always consult your G.P. first for any medical advice and to rule out any serious illness or before starting any new regime or self treatment. The contents of this article are for informational purposes only and are not intended to prevent, diagnose or cure any medical conditions. The publisher of this article or any information provided on this site including text, graphics, images, cannot be held responsible for any errors or any consequences arising from the use of the information contained in this article or this site or its pages. In case of an emergency always contact your Doctor and the emergency services immediately.